Working around the clock, seven days a week, a major cement mill located in the Mid-Atlantic region of the United States produces over 4,000 tons of cement each day. Spanning over 100 acres, the mill is part of a network of U.S. plants that produce more than 100 million metric tons of cement each year. Tasked with turning huge chunks of quarried limestone rock, sometimes as large as a grand piano, into the marble sized “clinker” that eventually becomes cement, the plant operates massive machinery under some of the most extreme conditions and dirtiest environments in the cement industry. Whether it’s a 400-foot kiln operating at 2,600°F or a large raw mill that produces the millions of pounds of thrust required for turning bare rock into raw mix, maintenance personnel are under constant pressure to ensure that all mission-critical equipment runs smoothly to avoid downtime that could cost them hundreds of thousands of dollars per day. In the first quarter of 2019, Smith Services was called upon to assist the plant during a planned outage to perform scheduled maintenance on aging equipment that would need to be in good operating condition as they were about to enter their busiest season. An electric motor and gearbox repair facility, Smith Services has also established a long-standing legacy of supporting the needs of the cement industry by specializing in mechanical repairs for raw mill rollers and rotary feeder boxes, stacker car wheels, clinker breaker shafts, coal mill rollers and table assemblies, rocker arm assemblies, primary fans, and other critical components. Because of an over 20-year successful working relationship with the plant, Smith Services was awarded the project due to their track record of providing exceptional service during plant outages, and in times of emergency when production was at a standstill caused by equipment failure. Each of the six coal mill rollers exhibited varying stages of wear and required slightly different scopes of work. The repairs made to the rollers included a combination of installing new bearings and seals, polishing the mechanical fits for the seals, bearing journals and bearing housings, and repainting the units in preparation for final delivery. 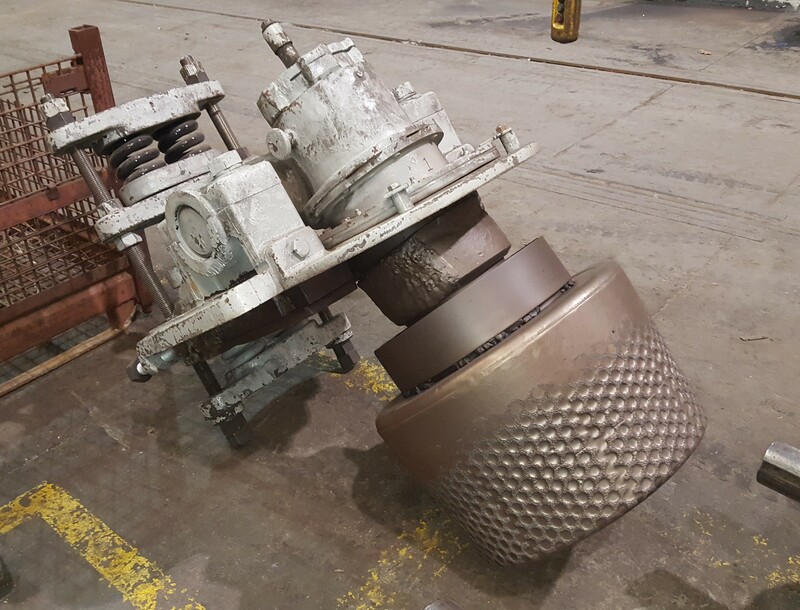 In addition, it was discovered that on one unit, the integrated arm that swings the roller mill down on the crushing table to smash the coal was damaged and needed replacement. Because the expected scope of work had grown considerably, the customer agreed to a longer lead time due to parts availability and the complexity of the repair.